To re-cap Article #1 from March 5th and as required by OSHA, NFPA and the NEC: "working space around electrical enclosures or equipment shall be adequate for conducting all anticipated maintenance and operations safely, including sufficient space to ensure safety of personnel working during emergency conditions and workers rescuing injured personnel." equipment is 600 V or less. These requirements apply to the width, depth, and height of these working spaces. To avoid body contact with energized parts when maintaining / servicing electrical equipment, a minimum of 30 inches is required in front of electrical equipment rated 600 V or less. This space depth must be clear to the floor. If rear access is also required to work on de-energized parts, then another minimum of 30 inches is required to ensure adequate access. All 30 inch "buffer zones" must also allow for equipment doors and hinged panels to open at a 90 degree angle to allow for the servicing of the equipment. - Condition 1: When there are exposed live parts on only one side of the working space, or, when both sides of the working space are sufficiently insulated. - Condition 2: When there are exposed live parts on one side of the working space and grounded parts on the other side. Concrete, brick or tile walls are considered "grounded". - Condition 3: Both sides of the working space have exposed live parts. Other requirements apply to communications systems which are covered by other NEC standards as well as the standards of the IT industry. 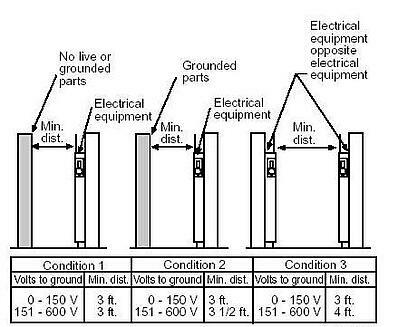 Our next article will complete this 3 part series and address the requirements of electrical rooms for equipment rated over 600V. Again, our thanks to Somesh Gailkwa at New Jersey Engineers for sharing this topic with us. FREE Demonstration: Join us for lunch on April 5th (1st Friday of the month), for a free demonstration of PowerCalc: software that automatically designs the power distribution system inside a facility and simultaneously generated the 1 Line Diagram.